The very first American Doctor Who convention was held in Los Angeles at the Sunset Hyatt hotel on Sunset Boulevard on the week-end of December 1st, 1979. At the last minute, Tom Baker and then-producer Graham Williams decided to come. 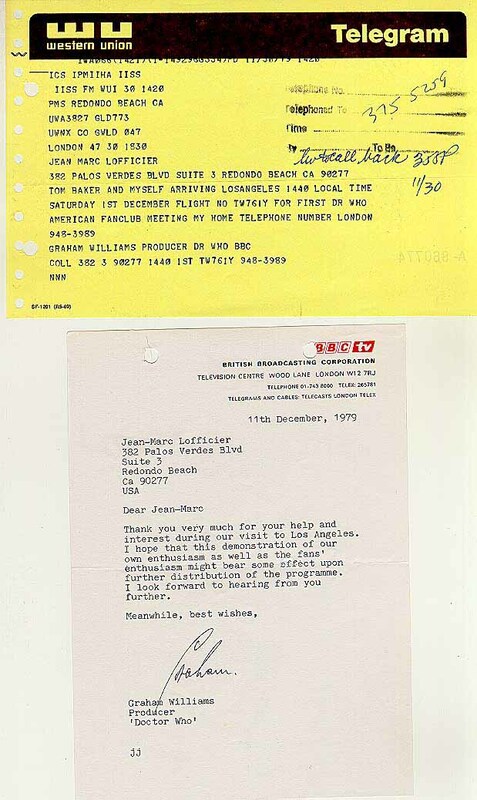 This is the actual cable they sent to Jean-Marc Lofficier to notify them of their arrival, and the subsequent thank you note. What happened was that a Los Angeles-based group of fans, led by Lucy Chase-Williams, had decided to throw a convention, and had advertised it on the local Channel 56 which used to run Doctor Who in daily episodic form. Upon seeing the ad, Jean-Marc had then contacted the group on behalf of Terrance Dicks (with whom he had been in touch, working on the first version of the Doctor Who Programme Guide), who had expressed an interest. The group was then delighted to issue an invitation to Terrance. Subsequently, Terrance let it slip at the BBC that he was going to L.A. for a Doctor Who convention. Soon after, a strike interrupted the shooting of SHADA, and producer Graham Williams and lead actor Tom Baker found themselves free at the last minute, and they decided to come too. The unexpected presence of Tom Baker -- at the height of his popularity in the U.S. -- Graham Williams and Terrance Dicks made this a superb Convention, one that still remains a treasured memory to any fan lucky enough to attend that day.